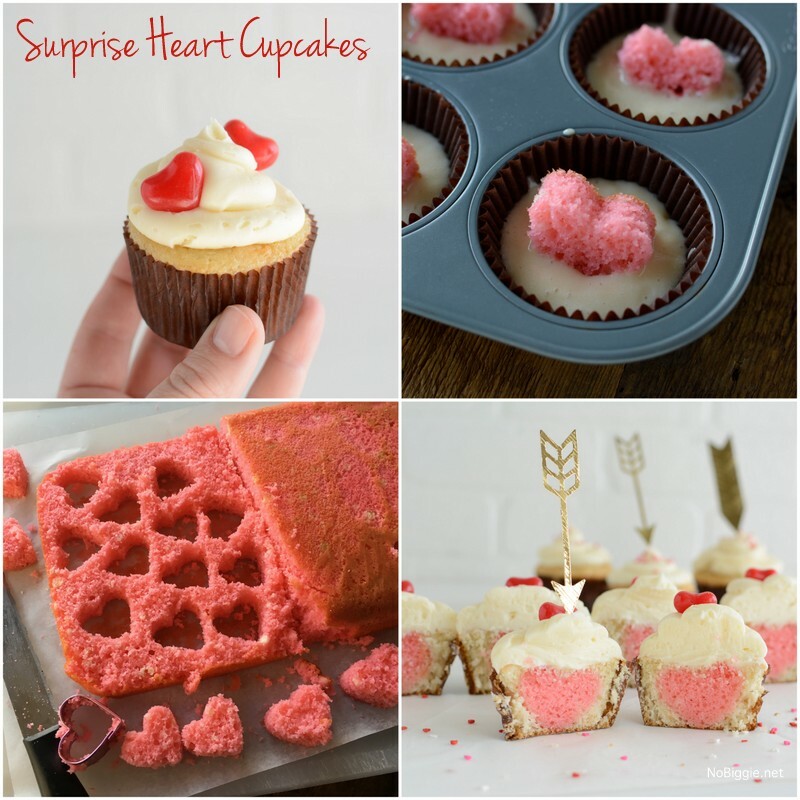 Surprise Inside Heart Cupcakes for Valentine’s Day. Happy Love Month! 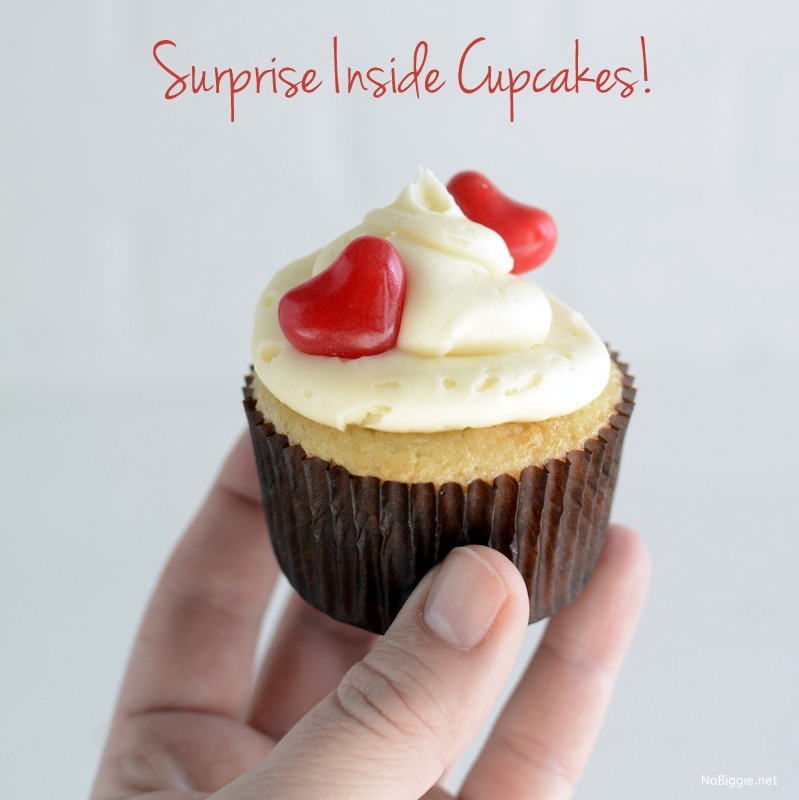 I have a fun sweet treat for you…Surprise Inside Heart Cupcakes. These are so fun to make, and so easy! The best part is cutting into them and seeing that cute little heart hidden inside. We made a fun little video to show you how simple they are to make. For this recipe we used a cake mix…two cake mixes! Super simple. If you have a favorite cake recipe, you can totally use that. To start, we mixed up one of the cake mixes and added red food coloring and baked it as directed. 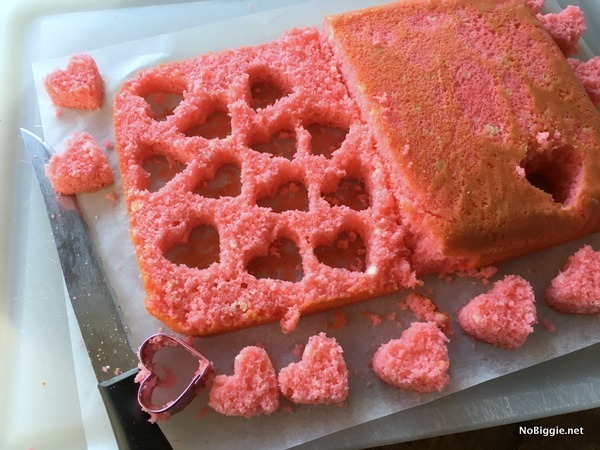 With the smallest heart shaped cookie cutter, we cut out a bunch of tiny red cake hearts. Then you’ll mix up the second cake mix as directed. 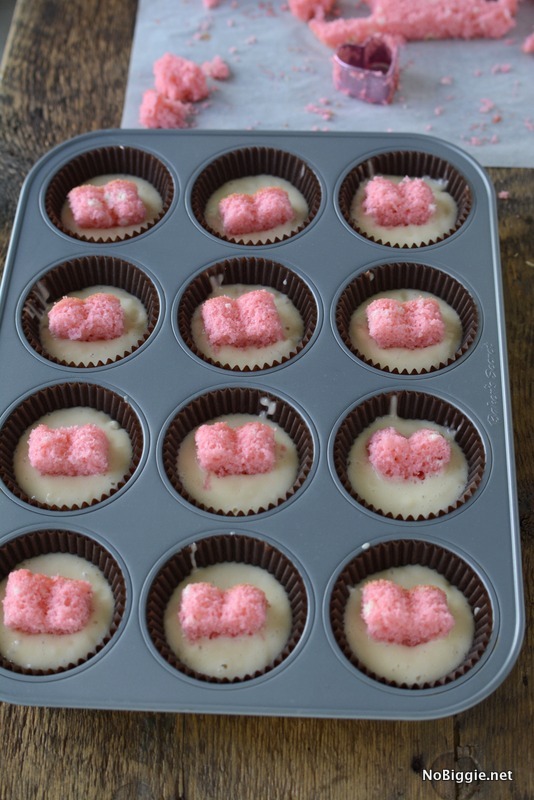 Drop a small scoop of batter into each cupcake liner. Then place a little red cake heart into the center of each one, all facing the same direction. This will help when you frost and cut into them. Then mix up your favorite buttercream frosting. 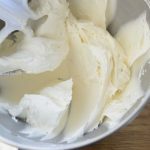 I’m not a big fan of frosting, but this homemade buttercream was perfection! It was like a smooth buttery cloud! In the bowl of a stand mixer fitted with the paddle attachment, mix the butter gradually increasing the speed. Take your time on this until the color of the butter really lightens up and is whipped. Add in the powdered sugar and slowly begin to mix the butter and sugar together. Starting slow will help avoid a powdered sugar mess. Mix on low speed until well blended and then increase the speed to medium and beat for another 3 minutes. Add in the vanilla and cream and continue to mix on medium for 1 minute, adding more cream if needed. Transfer to an airtight container and store in the fridge for up to a week or in the freezer for up to 3 months. Let it come to room temperature and re-whip in the stand mixer until light and fluffy again. Add a tablespoon or 2 of powdered sugar if it needs to thicken up. 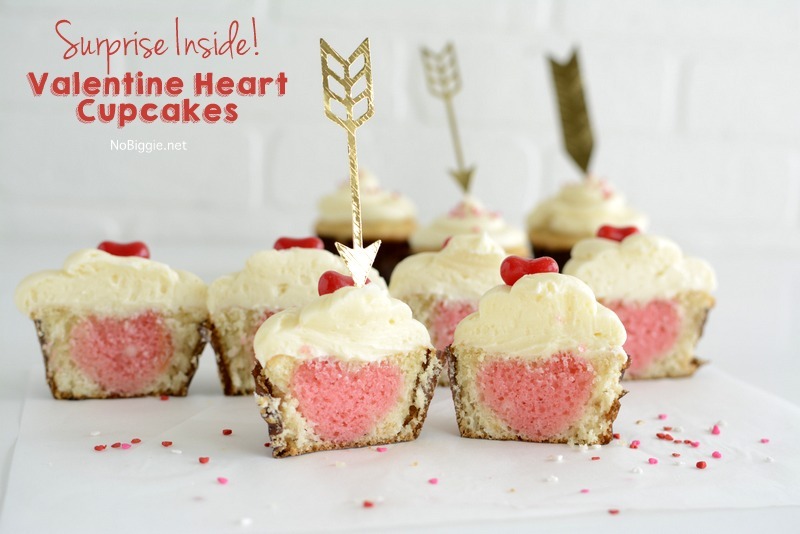 Frost each one and place two candy hearts on top…one on each side as a guide to know where to cut through the cupcake. Before you frost each one, remember where the heart is facing, and then once frosted, the candy hearts can also help. 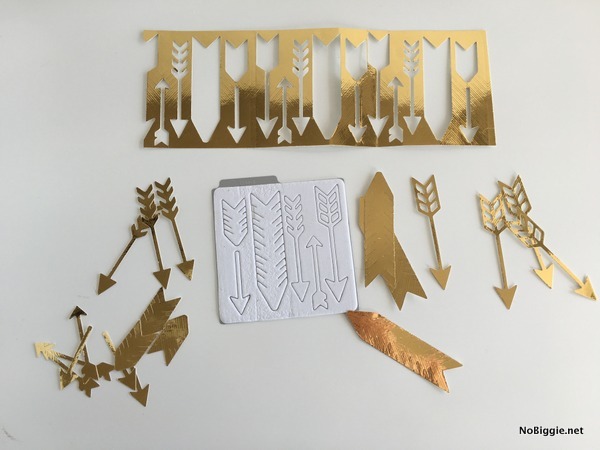 We made some cute gold paper arrows with this arrows cutting die by running it through the CuttleBug die cut machine. They’re so fun for Valentine’s Day! 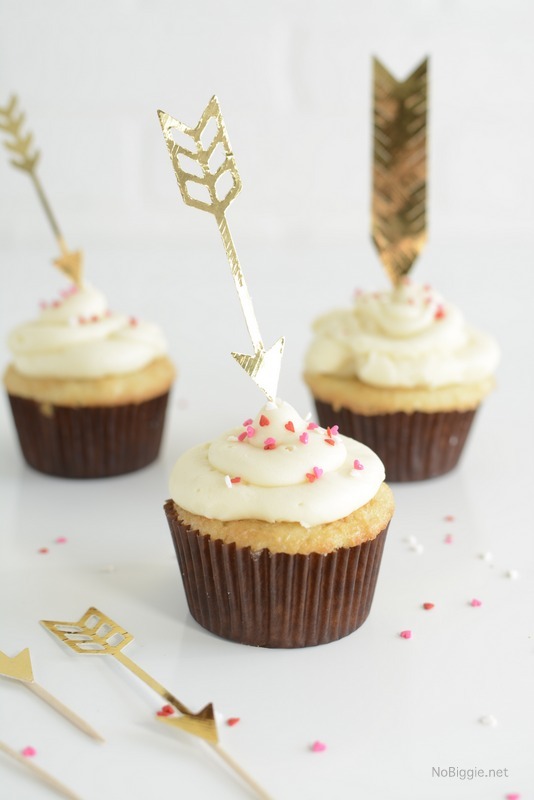 They make the cutest cupcake toppers for Valentine’s Day! 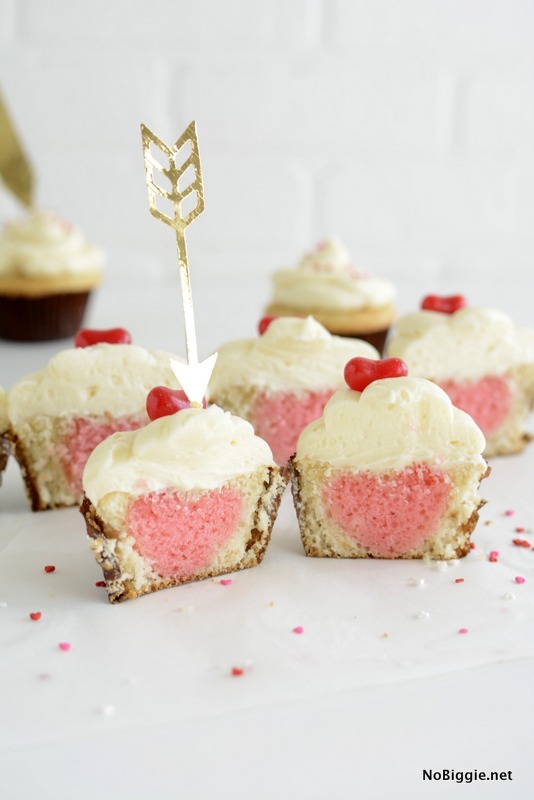 You will have to make these cupcakes for your Valentines this year! My family loved them, and I hope yours will too! 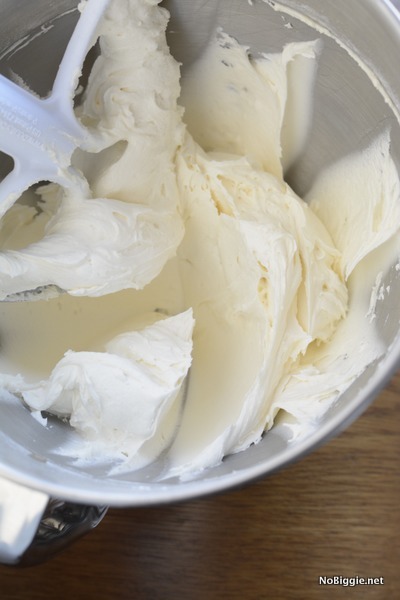 Do you have a favorite buttercream frosting recipe? Have a great day! Thanks for sharing!